Home > Travel > Flight > Cathay Pacific: Cyber Monday Sale with Special Economy Class Fares from SGD228 All-In! Book by 28 Nov 2018 Cathay Pacific: Cyber Monday Sale with Special Economy Class Fares from SGD228 All-In! Don't miss Cathay Pacific's Cyber Monday Sale with special Economy Class fares from SGD228 all-in. Book your tickets by 28 Nov 2018! 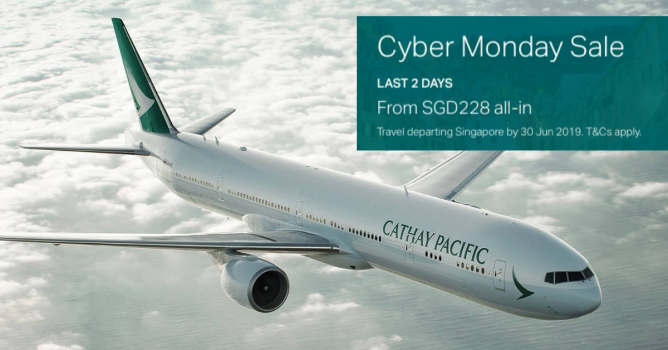 Promotion: Cathay Pacific Cyber Monday Sale with Special Economy Class Fares from SGD228 All-In! The above fares are on Economy Class, on per person basis and includes all applicable taxes/surcharges. Taxes and surcharges are correct as of 1 Sep 2018 but are subject to change due to currency fluctuation. The taxes are final at the point of ticketing. Next: [Neiman Marcus] Up to 50% off 100s of NEW Designer Sale arrivals!